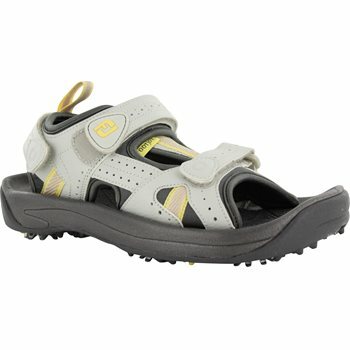 The FootJoy GreenJoys Sandal is a durable, stylish sandal with an easy-care synthetic leather upper and rugged DuraMax rubber outsole. Its EVA midsole and Velcro® Fit Strap ensure all-day comfort on the course, while the Pulsar™ cleats keep your grounded for a steady swing. I just love these sandal's. They are so comfortable. Size true.